The weather today was beautiful again. We started the day with breakfast at a downtown restaurant. It was the first time we have seen biscuits on the menu in the North. They turned out to be terrible soggy masses of dough covered with melted butter. Someone from down South needs to offer instruction. We cruised 21 miles and went through 4 locks to reach Little Falls. 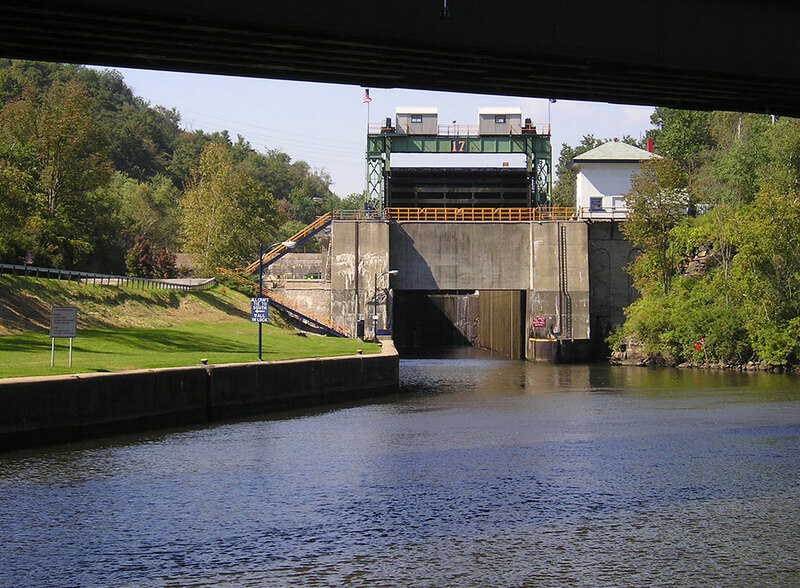 The most interesting lock (see photo) is at Little Falls. It rises 40 feet and claims to have one of the highest lifts in the world. What is more interesting is that the lower end gate is not hinged but rather a guillotine that drops down behind a concrete wall and stops the water. You have to pass under it to get into the lock chamber and it then rains dirty water on your boat. We are docked at the Rotary Club Park which has very good new floating docks with fountains power and water. The volunteer in charge drove us into town and gave us a quick driving tour. Left on our own we visited the Historical Museum and learned more about Little Falls than we wanted to know from the docent there. Little Falls like every other town along the Erie is struggling with the closing of all its factories. The focus now is on tourism so some have been converted to retail (antique stores) along the river. We walked through the antique mall and then back to the boat about 3/4 mile away.